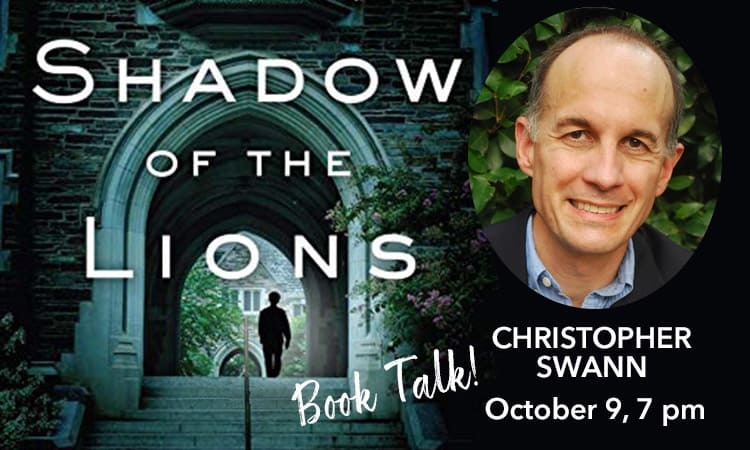 Author Christopher Swann will introduce you to his novel, Shadow of the Lions, an award-winning thriller and coming-of-age story. How long must we pay for the crimes of our youth? That is just one question Christopher Swann explores in his debut literary thriller, set in Blackburne, an elite Virginia prep school. When Matthias Glass’s best friend, Fritz, vanishes without a trace in the middle of an argument during their senior year, Matthias tries to move on with his life, only to realize that he will be stuck in a past of guilt and loneliness until he discovers what happened to his missing friend. Almost ten years after Fritz’s disappearance, Matthias is offered a job teaching English at Blackburne, where he is swiftly drawn into the mystery and stumbles into a web of surveillance, dangerous lies, and buried secrets. A sharp tale full of false leads and surprise turns, Shadow of the Lions is a moving, coming of age story about friendship, redemption, and what it means to lay the past to rest.